One of the most important measurements we can know about ourselves is our resting heart rate. Yet most people don’t know it. They can give you their cholesterol count (usually the total, not the breakdown of HDL and LDL see post – How to Improve your cholesterol numbers), but unless the person has recently visited his doctor he will be stumped when it comes to his resting heart rate, or its relevance to his overall health.. So how high is too high for a resting heart rate? There’s no absolute consensus about this, but most doctors agree that resting heart rates consistently in the upper range are not ideal. Norwegian researchers recently reported that for every 10-beat rise in resting heart rate, the risk of dying from a heart attack rose by 18% in women and by 10% in men. And a recent Japanese study showed that a resting heart rate higher than 80 beats per minute was associated with a greater risk of becoming obese or developing heart disease decades later. Diabetes and obesity are both risky for the heart, according to WebMD. It is not difficult to find your resting heart rate. Two ways are illustrated in the pictures. 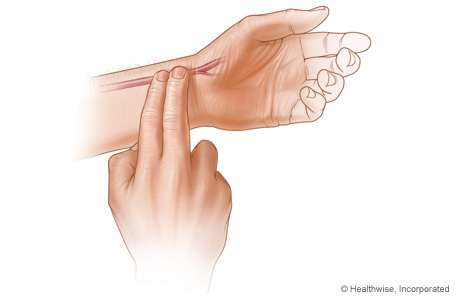 Press two fingers (not thumb) against your wrist below the thumb until you feel your pulse. I have found it easier to take my pulse by placing my fingers against my neck gently. Once you find the pulse, you can check your watch and count the beats in 30 seconds and multiply by two, or use 15 seconds and multiply by four to get the number of beats per minute. Do this when you are in a relaxed state, sitting for a while. Actually, first thing in the morning is best. Before you get out of bed. Although I am a senior citizen whose pulse should be on the high side, my resting heart rate falls in the mid 40s. I guess this is a result of my daily bicycle riding. You can start to lower your resting heart rate by exercising regularly. Update: We are in the age of wearables which count our steps and monitor other bodily functions including heart rate. I wrote up the Pulse Oximeter from Costco which tells not only your heart rate, but the amount of oxygen in your blood, too. This info. is as valuable as cholesterol numbers and other blood chemistries. Pulse rate (and blood pressure) are two factors associated with the phrase, “SILENT KILLER.” As Tony suggests, keep a close watch on these values. Don’t simply wait to find out during an annual exam. Be proactive and increase your chances for healthier living! Thanks for sharing that and congrats on your improvement. Keep up the good work!